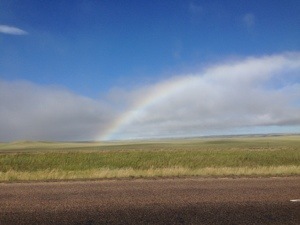 Day 3: Billings, MT | Hold on, I'll tell you! On the road again. 51 degrees, I’m not complaining! Not too long down the road the sun came out, along with this beautiful rainbow. 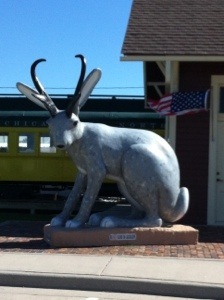 First stop, Douglas, WY, to see the World’s Largest Jackalope. Douglas also boasts of being the home of the “former” World’s Largest Jackalope but we didn’t go see it. I mean really, who remembers Miss Runner-up? 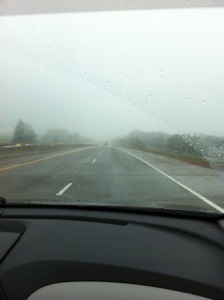 A few miles out of Douglas we went to see Ft. Fetterman. this fort was completed in 1867 and named for Captain William Fetterman. (More about him later!) 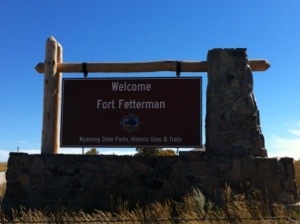 Ft. Fetterman was not a very popular outpost. Harsh winters, soil no good for gardens so all supplies had to be brought in, and a lack of, shall we say, “female companionship”. The latter problem was remedied by the opening of a “Hog Ranch” across the river where the soldiers could find gambling, alcohol, and you guessed it, “female companionship”. Even with entertainment available the fort didn’t make it. It was abandoned in 1882. 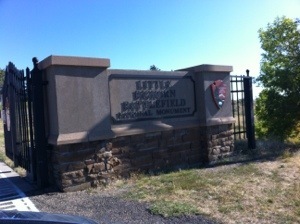 The gate was closed and locked so we just walked up to view the site of the former fort. 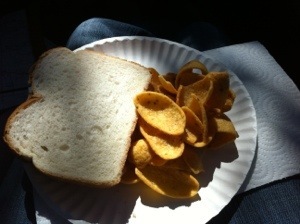 We drove on to Casper, WY and stopped for a picnic lunch in the car. Even my sandwich tasted better with such a beautiful view! 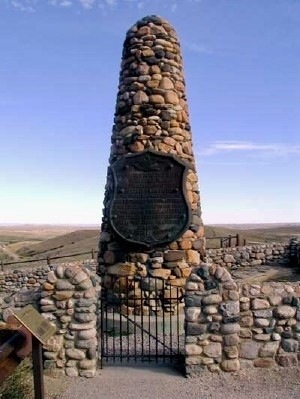 Just south of Sheridan, WY there is a monument to remember the Fetterman Massacre. Remember Captain Fetterman? Well on December 21, 1866 Captain William Fetterman was lured into an ambush. He had once boasted that he could ride through the entire Sioux nation with 80 soldiers but on that day in December 1866 he met an overwhelming group of warriors and was killed along with (who guessed it?) exactly 80 men. They were lured over a ridge by a young warrior named Crazy Horse. Maybe you’ve heard of him. This event happened about 10 years before Little Big Horn (Custer’s Last Stand) a larger, more infamous massacre. 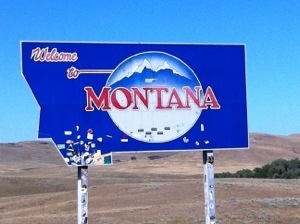 The Great State of Montana! On June 25, 1876, General George A. Custer died fighting at Little Big Horn along with 262 troopers in the U.S. Army’s 7th Cavalry. Known as “Custer’s Last Stand”, it was an overwhelming victory for the Native Americans who were led by several leaders including Crazy Horse. 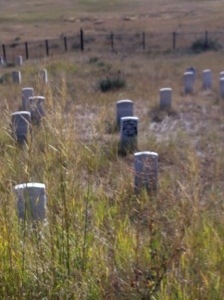 The markers show where each soldier fell. 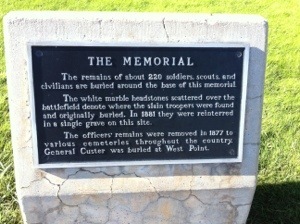 The officer's bodies were sent back East (Custer is buried at West Point) and the rest are in a mass grave under the large monument. Word of the massacre reached the East as America was celebrating the Centennial. The Battle of the Little Bighorn was a short-lived victory for the Native Americans. 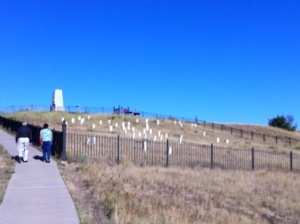 Federal troops soon poured into the Black Hills and many Native Americans surrendered. One article I read said that there are only three things known about the battle: Custer came, Custer saw, and Custer got his *** whipped. It is a beautiful site and the interpreters here do a wonderful job. 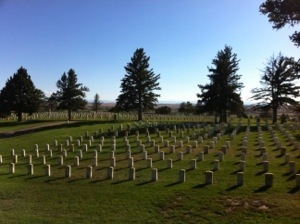 There is also a National Cemetery on the grounds. 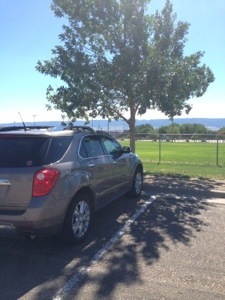 We drove on to Billings, MT, (go ahead, break out those old maps… it’s WAY up there!) 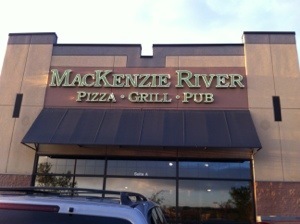 had a nice dinner and ready to hit the sack. Tomorrow is another day! They warned us their food is spicy. They don’t KNOW spicy!